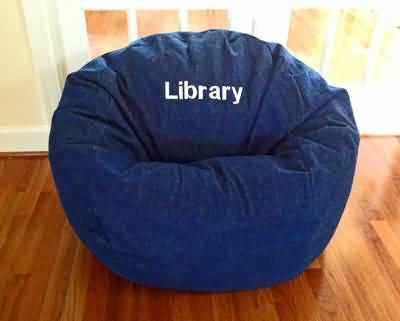 Bean Bag Chairs for Libraries, Schools, Hospitals, more! Ahh...Our bean bags hold up! Since 1998, Ahh! Products has been a trusted brand name for bean bag chairs worldwide. One of the things we pride ourselves on is how durable and long-lasting our bean bags are. The best proof of that is how well our products have performed in commercial settings. You can find us in commercial settings such as libraries, schools, hospitals, daycares, museums, and various offices nationwide. That's because these types of locations need a bean bag chair that will last, even with repeated use daily by all sizes of people. Our bean bags are also soft and come in tons of styles. For example: denim, cotton twill, microsuede, even faux fur bean bags! You also get an inner liner, so when the librarian or teacher needs to wash the cover, the filling is contained safely inside the inner liner. This liner is water-repellent, which is an extra benefit! Super duper strong, too! That's because every bean bag cover and liner is double-stitched, so no breaking or tearing like with other cheap bean bags out there! That's right folks, no more leaking filling to make a mess. All liners come with child-resistant zippers, so adults can access the filling inside, but curious kids cannot easily unzip them. So, if you need a high quality bean bag that is durable and strong enough to hold up to commercial use, Ahh! Products has the right ones for you! Proven since 1998 to withstand even the roughest kids! The Manor, MI. Special Education School for developmentally disabled children. Via School, CA. Services to the developmentally disabled, offers intensive educational and therapeutic programs for children and adults. University of CA Los Angeles, CA. University of St. Mary, KS. Oak Grove Montessori School, CT.
McLennan County State Juvenile Correctional Facility, TX. Texas Juvenile Detention Center, TX. Mira Monte High School, CA. Sheboygan Falls Middle School, WI. North Central High School, IN. Shore Country Day School, MA. Liberty Lake Municipal Library, WA. West Tisbury Public Library, MA. Westchester Jewish Community Center, NY. Bud Werner Memorial Library, CO.
*Well-known Children's Cancer Research Hospital, TN. (prefers to remain nameless) *Only Ahh! bean bag chair pass their strict testing requirements to be used for their kids! Children's National Medical Center, MD. Saint Frances Children's Center, WI. Queens Children's Psychiatric Center, NY. St. Luke's Clinic ENT, ID. Washington Rehab & Nursing Center, FL. Upper Valley Medical Center, OH. Green Mountain Psychiatric Care Center, VT.
Corsicana Residential Treatment Center, TX. Vermont Department of Mental Health, VT.
Residence Inn by Marriott, WA. St. Regis Deer Crest, UT. Royal St. Kitts Golf Club, St. Kitts. Paradise Beach Front Properties, MD. Oyster Harbors Country Club, MA. Smithsonian American Art Museum, DC. Stafford Air and Space Museum Planetarium, OK.
Children's Museum of the East End, NY. Museum at Bethel Woods, NY. Cosi - Center of Science & Industry, OH. NASA Jet Propulsion Labs, CA. Pulte Model Homes, Nationwide, USA. Autism Support & Programs, NC. Big Brothers Big Sisters, MI. Storm8, CA. Developer of social games for Iphone & Android. Want to see who else uses them?